Despite log building’s humble history, logs do have their aristocratic side. It’s best reflected in the Great Camps of the Adirondacks, those summer playhouses of the Rockefellers, Vanderbilts and other arch-capitalists. The most imposing of these is Sagamore Lodge. Sagamore might epitomize the Great Camp look, but what’s remarkable, from a log standpoint, is that it isn’t log built. It’s “half-log” built. The builders split raw spruce logs and attached the halves, with bark left on, to ordinary framing lumber — a precursor of half-log, super-insulated homes, which emerged in the mid-1970s and grow ever more popular, because of their decorating versatility and energy efficiency. After building Sagamore, West, deep in debt, sold it to Alfred G. Vanderbilt in 1901 for $162,500. His grandson, the second Alfred G. Vanderbilt, recalled Sagamore appearing “like a jewel, those extraordinary wooden buildings set perfectly on the glittering lake.” Besides “the fun and enthusiasm that pervaded Sagamore,” he noted, its appeal was that family members and guests were safe there from public scrutiny. After Vanderbilt died in the sinking of the Lusitania in 1915, his widow, Margaret Emerson, kept Sagamore going strong, hosting a parade of celebrity guests, until World War II changed the camp’s atmosphere. Before the war, women guests were served breakfast in bed. During the war, the women had to come to the dining room for their breakfast. “It was rough,” quipped Dorothy Rogers, a frequent guest. The downfall of all the Great Camps was upkeep. Emerson maintained Sagamore until 1954, then donated it to Syracuse University, which later sold it to the state of New York. Sagamore deteriorated under a procession of owners, until a nonprofit acquired and restored it. Today, it accommodates guests, nowhere near as lavishly as the Vanderbilts lived, but comfortably and at reasonable rates. 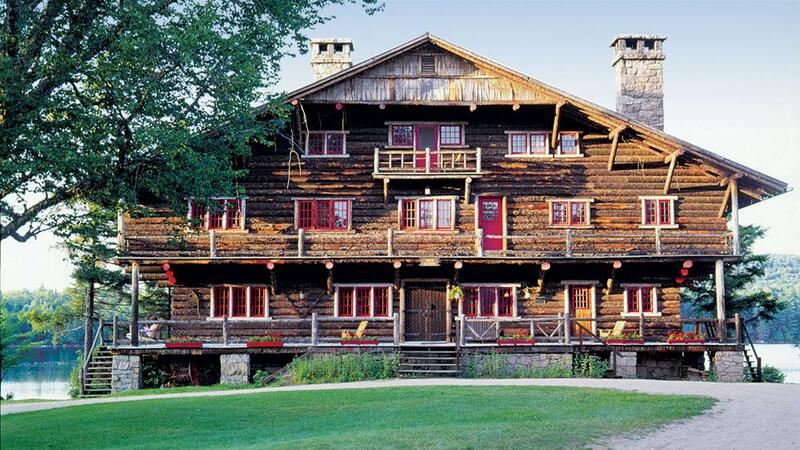 Although the interior is enchanting, Sagamore’s log exterior is weather-beaten. It still sports that customary Great Camps look, though, and visitors experience the splendid setting that inspired Durant to create Sagamore, which in turn begat other grand log lodges, especially in the settled West. Besides its noble history, Sagamore represents a contemporary ethic, identified by its ablest historian, Howard Kirschenbaum: It was built to last, it was built of natural materials and it was built in harmony with nature. These enduring qualities transcend the wealth that sustained Sagamore and have inspired log buildings, grand and modest, ever since.